What will 360°ERP fix in your business? As CEO tries to understand the companies, overall performance, he may find many difficulties, and the different version of truth. Finance has it own set of revenue numbers, sales has another version, and the different business units may each have their own versions, for how much they contribute to revenue. ERP creates the single version of the truth that can not be questioned because everyone is using the same system. Especially in companies with multiple business units, HR can get a unified, simple method for empowering the employees together their own information and give themselves service portal with which to communicate. Manufacturing companies – especially those with an appetite for mergers & acquisition, often find that multiple business units across the company make the same widget using different methods and computer system. ERP system comes with the standard system for automating some of the steps of a manufacturing process. Standardizing such process using the best practices, and using the single, integrated computer system can save time, increased productivity and reduced man hours. ERP helps the manufacturing process how more smoothly, and it improves visibility of the order fulfilment process inside the company. That can lead to reduced inventories of the materials used to make products (WIP inventory) and it can help users better plan deliveries to customers, knowing what is lying in which stories reducing the finished goods inventories at the warehouses and shipping docks. To really improve the flow of your supply chain. 360°ERP’s Enterprise Solutions will give real-time visibility across an entire enterprise, so that one can measure and improve business processes, reduce costs and cycle times, get more productivity, profitability and eliminate bottlenecks. 360°ERP has expertise in offering business solutions using comprehensive software and services that can address the customer’s unique needs. Exposure to various industry segments have helped clients achieve results that they look for. innovation will be our hallmark. Our creative teams coupled with low overheads will translate into effective ROI for clients. 360°ERP system includes the work flow base navigation , 360° ERP interface with the various devices like RFID , Auto Attendance system , Barcode, PDA’s , smart card , Process control machine, ATM’s etc. We 360° ERP offers solution which is platform independent on the client side, web base (eliminates place & time barrier), SMS & e-mail alerts & includes the source codes of customised modules. 360°ERP is well-diversified industrial conglomarate. The aim is to sell standardize & custimised commercial solution. 360°ERP is in the business of Implementation, customization and development of enterprise solutions for small & medium-sized (SME) companies. Our company will develop and market own enterprise ERP software product - 360°ERP. Apart from this the company will also offer services in the area of enterprise solutions using State-of-the-Art technology solutions. Our expertise and domain knowledge in various industry verticals combined with the vision of our management team enables us to offer wide range of solutions. 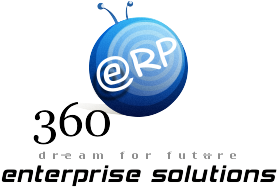 360˚ERP’s Enterprise Solution developed using 360˚ERP’s SoftRobot® technology, allow any organisation to address their unique requirement.